True 1080p Full HD technology is more than just entertainment, it’s an experience. And it’s the pinnacle of picture quality, engulfing and entertaining you with spectacular detail-rich, eye-popping colors and super-sharp, ultra-realistic images that enhance anything and everything on your screen. With our Blu-ray drives, you’ll feel like you’re seeing your favourite movie for the very first time. More room for more movies. The BD disc can really pack it in. When it comes to capacity, BD discs truly outsise-and outclass-DVDs and CDs. In fact, with a single layer capacity of 25 GB and a double layer capacity of 50 GB, you’re talking almost five times as much room as a DVD and 70 times as much room as a CD. Ready for a quadruple feature? Because that translates into 135 minutes of High Definition movie time and nine hours of standard definition movie time. Let BD Advisor guide you through the Blu-ray. Blu-ray lets you get the most out of your movie watching, so shouldn’t you get the most out of Blu-ray? That’s where BD Advisor comes in. It lets you unlock the power of interactive high-definition movie viewing with PowerDVD and Blu-ray Discs. BD Advisor helps you test your system and understand Blu-ray basics as well as suggest upgrades. Now you can always enjoy the best Blu-ray has to offer. Give your DVDs a movie-makeover. Breathe new life into your movie collection with Samsung’s up-scale technology. It gives your standard definition DVDs a dramatically different high resolution look. And it gives your movie-viewing experience a cinematic boost. By up-scaling, your favourite DVDs will feature the same brilliant details and rich, robust colors you’ve come to enjoy from the high definition content on your HDTV. Capture it all in HD. Whether it’s her first steps or last night’s party, capture it all in HD video using your DV or HDV camcorder, and burn it to make your own DVD. It doesn’t matter what format you prefer - mpg, mp4, or avi - Samsung’s Powerproducer makes it possible to turn memorable moments into DVD brilliance. Samsung’s Optical Disc Drives maximize your Blu-ray experience. Not only do they maximise Blu-ray resolution, their 2-lens and 2-laser diode system reads and writes CDs and DVDs with more precision focus than most ODDs single lens system. 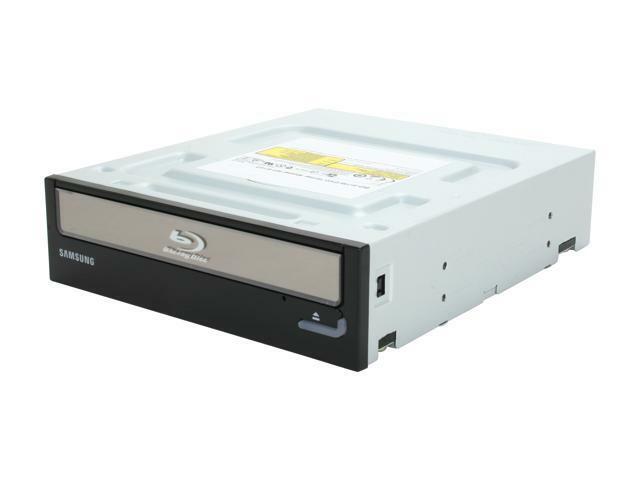 Combine that with improved BD disc reading quality and DVD double layer disc writing quality, and you’ll find our Optical Disc Drives were built to be as reliable as they are enjoyable. Put your favorite shows on disc. Don’t let the networks tell you when to watch your favourite shows, you can watch them whenever you want when you match a TV tuner card with your PC and burn them to a DVD through our Optical Disc Drive. You’ll have the power to capture your favorite TV shows to watch whenever you want. It even lets you capture still-frames and burn the captured TV content into Discs. So watch TV your way-any show at any time. Enjoy the exceptional picture and sound quality of high-definition Blu-ray movies with Samsung’s Blu-ray Combo, a great solution for Blu-ray Disc (BD) authoring. The SH-B123L Bluray disc drive features 12x BD-R read speed, 16x DVD+R write speed, SATA interface for faster performance and LightScribe technology that you can create customized labels onto a special coated LightScribe disc. LightScribe Technology Say goodbye to adhesive labels, paint or ink! With the innovative LightScribe technology, the SAMSUNG SH-B123L burns any image or text directly onto the surface of LightScribe-compatible CDs or DVDs to create your own professional-looking disc collection. SATA Interface The SAMSUNG SH-B123L features SATA interface to provide more stable and speedy data transfer for faster and smoother read and write performance. Pros: It reads Blu-rays fine for me using PowerDVD 15. I can even rip both DVDs and BDs with no issues and have been doing so for several years now. I use software not available in the US so do your own research. Cons: None! This drive doesn't deserve the low ratings. Pros: You can read stuff from it... you know, as long as it's NOT an ACTUAL BLU-RAY DISC. But other stuff, without DRM, it will read. Cons: You have to buy additional software to get this to actually work as intended. You can buy this drive plus a blu-ray DVD. But it's still not enough to watch Blu Rays on this drive. Thanks, SONY. Other Thoughts: So I bought this literally 5 years ago, and there is STILL not a free blu-ray software that will let me use this drive to its fullest potential. Not that I am asking much from its "fullest potential". I really just want to watch Blu-Rays on my computer. I guess I am just a horrible person for wanting this. And yet, 5 years later, that is still too much to ask, without spending >$50 more for software that SHOULD be included. Cons: They've discontinued this dog of a Combo-drive. Good riddance. Had to swap it out with an LG because this dog stopped being able to reliably rip anything. Stinks... glad its dead. Cons: Software it came with didn't work very well. Device is very load. From day one burning has been hit and miss. Insert blank cd, it tries to burn then says to insert supported media. After about 30 tries it starts burning. Sometimes it would get 99% and have an error. Then I'd have to try 30 more times. A lot of times when you insert a blank cd it spits it back out and says to insert a blank cd. The longer I've owned it, the worse it's gotten. Samsung doesn't support the product. When you go to their website it isn't even there. Pros: The drive works well from what I can tell, I watched a couple blue ray movies with it. Cons: Come bundled with Cyberlin Power DVD 9 which plays Blue ray discs, but support stopped in 2011, so any new DVD's (Prometheus) will not work and there is no way to upgrade without buying a software package that costs as much as the drive itself. Other Thoughts: I guess if you buy a drive make sure you have blue ray player software that is up to date bundled with it. Cons: The reason I gave this one star is because when I purchased it I didn't know that I needed another program to play my Blu-ray discs. Mine just came bubble wrapped in a newegg box. I've read some of the reviews saying that theirs came with included software, mine didn't. If I were able to play all my Blu-ray discs I would of given this 5 stars but since I can't It'll only get 1. Cons: I registered at the Samsung site to try to obtain support. This model does not exist according to their website. Just hope it doesn't break. I'm done with Samsung.